Thank you Alscess for sharing your wonderful ideas. I will definitely be trying them soon as I have some fresh fish fillets in the freezer. This week I have made another drink using ingredients purchased at the morning market in St. John’s from the wonderful ladies there: Sorrel drink. Sorrel, as it is known in the Caribbean, is also known as Roselle elsewhere in the world, and it is a species of Hibiscus plant. It has a multitude of uses from food colourings (vibrant red) to jams, jellies and tea. It comes from West Africa, where most of the Antiguan population originally came from, and has a number of medicinal uses too. 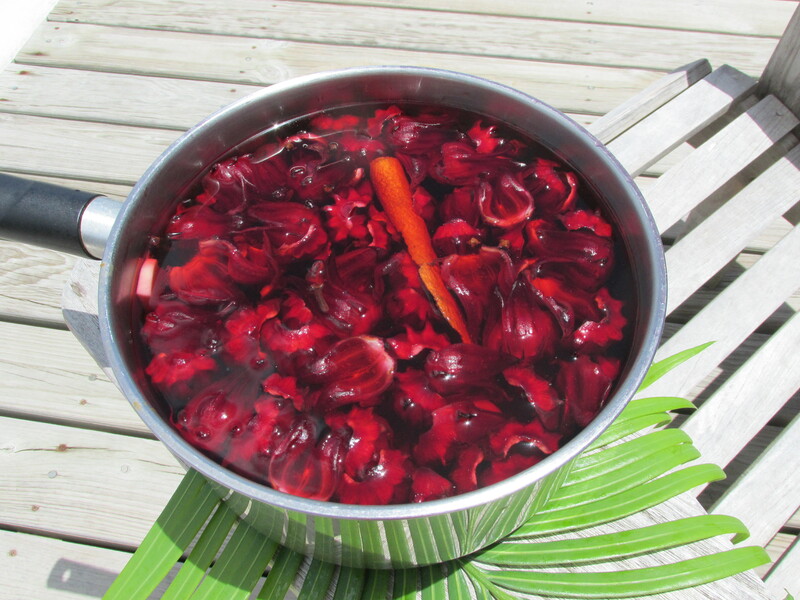 Here in Antigua it is primarily used to make the famous Sorrel drink. It is just the beginning of the harvest season now and I was lucky to get a bag of sepals with the hard centre removed making them immediately ready to use. Place the ingredients in a large jug / saucepan. Cover and leave to stand at room temperature for 2-3 days. Strain through a sieve and leave to stand for another 2 days. Strain again through muslin and refrigerate the finished product. 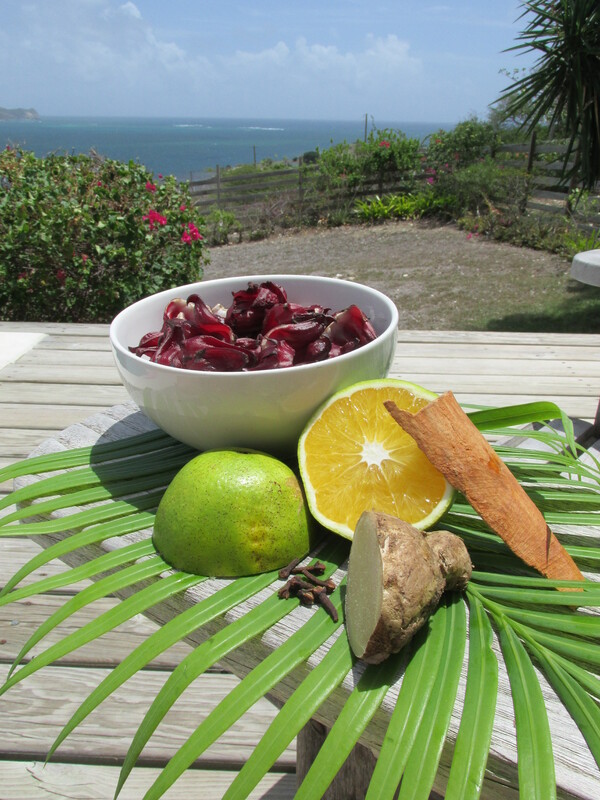 Use as a juice over ice or with rum as an apéritif (pre-dinner drink). 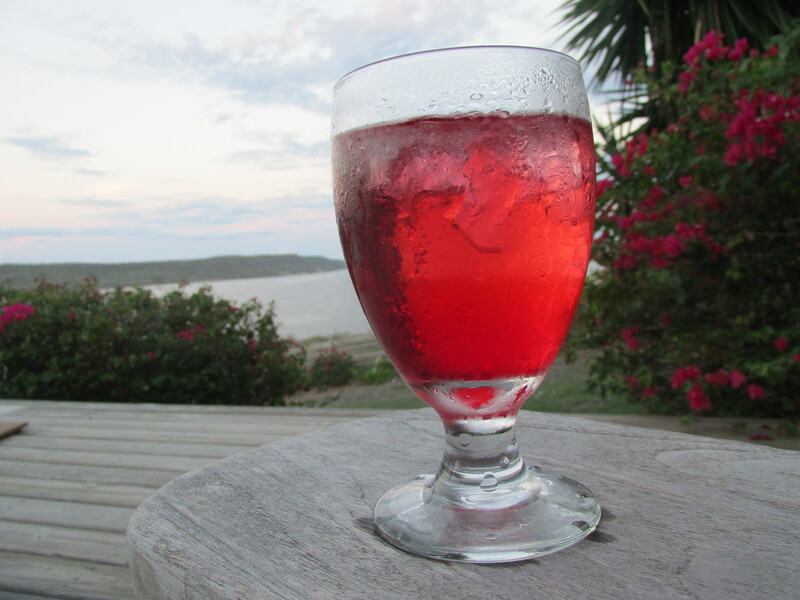 This is a wonderful exotic drink and I love to serve it as a ‘welcome-drink’ with a bit of a difference when friends visit for apéro in the late afternoon. It is perfect as those that prefer to have a non-alcoholic version can essentially share the same drink but without the rum. And who doesn’t love something homemade with love! Do you have any interesting pre-dinner drink ideas? Cheers and see you next week when I get to review the wonderful Stingray City here in Antigua in the West Indies.